Thiruvananthapuram Range Inspector General Manoj Abraham said, the department is considering all possible options to ensure a smooth pilgrimage season this time. 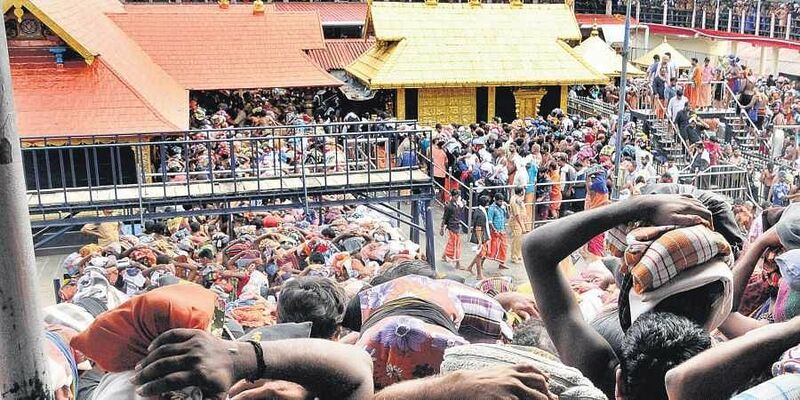 THIRUVANANTHAPURAM: Managing women pilgrims through 18 holy steps at Sannidhanam in Sabarimala temple will be a herculean task, according to a recent assessment made by Kerala Police. Regulating the flow of pilgrims through the holy steps is central in crowd management during the pilgrim season at the shrine. For proper crowd control, at least 75 pilgrims should pass through the steps every minute and the flow should be steady when the Sanctum sanctorum is open to prevent long queues during the peak pilgrimage days. Usually, police are deployed in different shifts at the holy steps to help the pilgrims ascend the steps. "If more women pilgrims arrive, then the flow will be slow. Above all, it will not be a viable option to deploy women cops on the side of the holy steps to help them ascend the steps. If male cops are deployed to guide women pilgrims, some women may raise objections, " said a police officer. "We are also planning to implement a totally digital driven darshan system with time slots. Soon,we will be coming out with a detailed crowd management plan to regulate the flow of women pilgrims, " he said. Another concern shared by police is that deployment of large number of women police personnel at Sannidhanam can only be done after ensuring proper facilities for them. "We will not be able to deploy women cops for those kinds of tasks at Sannidhanam which usually require high physical activity. So we will not be able to reduce the number of policemen also," added another officer.